It’s everywhere right now: in your home, at work, on sale at the store. People just KEEP GIVING IT to you. And you want to stop – you really, really do – but it feels impossible. I’m talking about SUGAR. 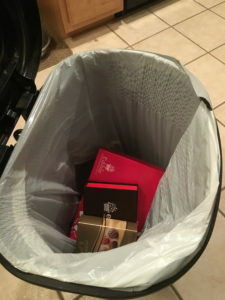 In the days leading up to and following a holiday known for making sugar plums dance in your head (I’m looking at you, Christmas), a majority of us are strung out on the stuff, and there’s a reason why. Sugar is like the cocaine of foods, leading us on a high only to come down wanting more. Studies shows it even lights up the same area of the brain related to drugs and gambling. And just like the hard stuff, that short high will lead to long-term problems – fat on your bod, anxiety followed by sluggishness and crappy skin. You probably knew all that. But like most people, one truffle led to half a cookie, and then before you knew it 300 calories worth of the white stuff got in your diet every day over the last three weeks. AND NOW YOU JUST NEED TO CUT IT OUT. Chuck that sugar in the trash! So you turn to a “sugar detox plan.” It prescribes lots of lettuce, asparagus, baked chicken and lemon water to “cleanse” your body of sugar and “alkalize your body’s PH levels.” It’s a great idea, in theory, but my problem with diets like this is that it relies on a heavy amount of willpower, which true recovering addicts (from drugs more legit than sugar) will tell you DOES NOT WORK. SO HERE’S MY PLAN: we’ll get you to the green stuff and water, but first we will shut down the crazy sugar-craving part of your brain. STEP 1) GET IT OUT OF YOUR HOUSE. Think of this step as the part where the addict is removed from the situation by entering a Canyon Ranch-like facility. Give it away or throw it away, but trust me no one will miss it. If it’s in proximity, you will eat it. STEP 2) Eat anything you want, as long as it’s not processed. This is my favorite rule of all time. If your food walked, swam, flew, or grew out of the ground, it’s approved. This will keep you away from processed wheat products and hidden sugars, but will satisfy your nutritional needs. But there really isn’t a lot of restriction, so it’s easier on your willpower. Craving a cookie? Put some peanut butter on a sweet potato. Or eat a delicious, nutritious full meal with all things roasted, grilled or baked. You will be so satisfied from all the good-for-you protein, fiber and micronutrients you won’t miss sugar. STEP 3) Rehab your energy. Oftentimes, you’re reaching for sugar because your energy is dragging. While you detox from sugar, you make be extra sluggish and cranky while your body goes through withdrawal. Make sure you get your 7-8 hours of quality sleep, drink a glass of water before every meal and REST after all the holiday hoopla. STEP 4) Ease up on the caffeine. Caffeine has the same spike-and-drop energy properties as sugar. Don’t over-rely on coffee to get you through the sugar withdrawal, because it will leave you craving sugar more. One to two cups WITHOUT SUGAR is responsible, anything more than that is excessive. Don’t LOVE exercise yet? Try new sports, new ways to lift, new classes. Hang in there, it’s coming! 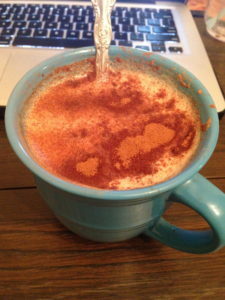 SECRET WEAPON: If the chocolate cravings are INTENSE, whip up some “protein hot chocolate.” The ingredients are simple – you just a scoop of any chocolate protein powder and milk (I use unsweetened almond milk). Blend it up, nuke it for two minutes in the microwave and sip something tasting warm and sweet (that isn’t actually sweet) that will keep you full and support muscle growth, too. 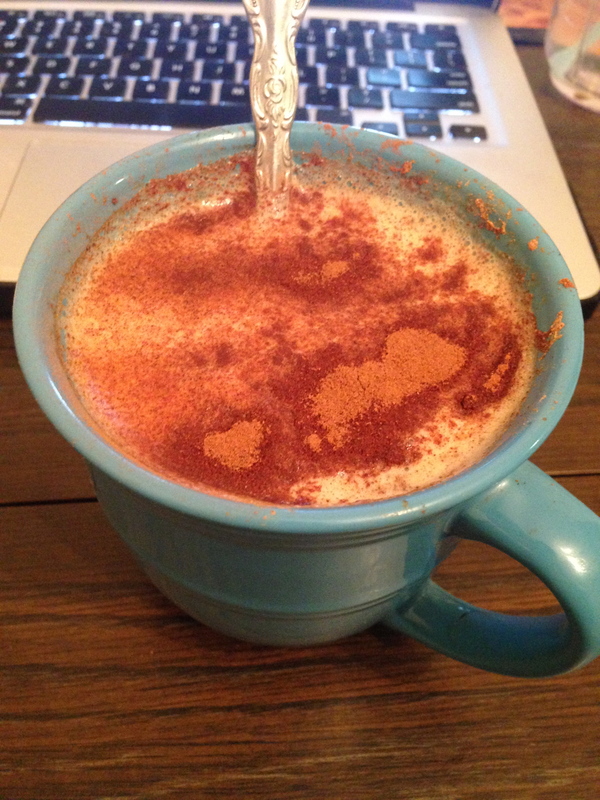 Top with cinnamon if you’re fancy. My secret weapon for fighting sugar and chocolate cravings. USAGE INSTRUCTIONS: Use these tips for as long as you like, providing you are not way over your personal calorie budget with Step 2. I’ve found with these tips it takes me two to three days to really “detox” from sugar. Then I can feel really good about eating lots of greens and drinking lemon water. P.S Maybe next year, you heed my warning on baking the traditional way with tons of sugar and processed ingredients. Rehab your recipes to contain whole food ingredients and you won’t need to detox yourself from sugar next year.